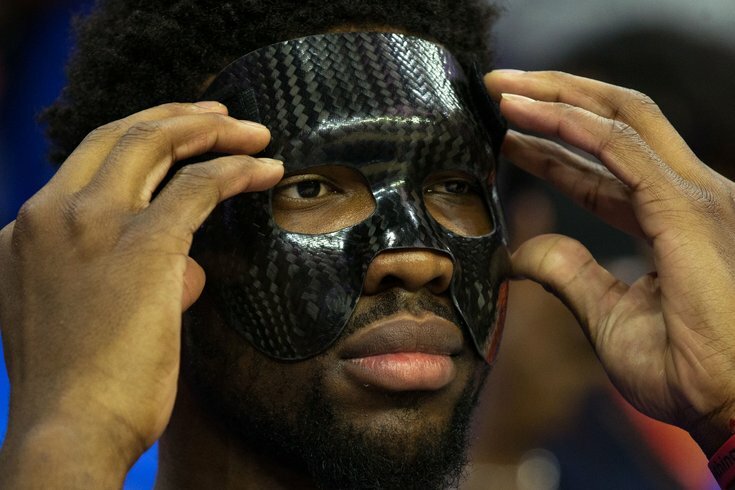 Philadelphia 76ers center Joel Embiid (21) puts on his protective mask before Game 1 against the Miami Heat. Joel Embiid will rejoin the Sixers and play in Game Three vs. the Miami Heat, according to Sixers head coach Brett Brown. Originally listed as doubtful on the team's official injury report before being upgraded to probable a few hours before tip, Embiid was still in the process of being fully cleared by the medical team responsible for his facial surgery, a source told PhillyVoice on Wednesday. "We like what we have seen over the past few days. We like what we saw at shootaround today," said Brown during pregame availability on Thursday. "There needed to be league approval of a mask, and the design of that and the sophisticated that goes in with, shaping that to his face and all the things you know go into caring for his health. And so that's moving into a positive way as well." Embiid will jump right back into the starting lineup for the Sixers, though Brown noted it would not come without some hurdles for Embiid and the team. It comes with the reality that we haven't had him for a while. We have been playing a style of basketball that has suited this team. Absorbing Jo back into the group — us with him, him with us — that's going to take a little bit of a time, I don't see that being a seamless transition. I do see his benefit immediately defensively, but all of us would not be that wise to think it's just going to keep chugging along, the rhythm and the flow we've been lucky to have. It's going to take some time. But all day every day, I want Joel Embiid in this mix. He has the chance to make us different. The Sixers have not discussed a formal minutes restriction, according to Brown. His availability in terms of volume of minutes will be determined based on how his conditioning holds up over the course of Game 3 and beyond. Embiid's inclusion in the lineup comes at a pivotal time for the Sixers, who are looking to recapture homecourt advantage after surrendering it in a tough, physical Game Two loss to the Heat back home in Philadelphia. Without their big man in the middle, the Sixers struggled to cope with Miami's ball pressure on the perimeter. With him, they will have a release valve on offense and a safety blanket on defense, the natural result of adding one of the league's most impactful players. Heat coach Erik Spoelstra acknowledged the challenge presented by Embiid during his pregame remarks, though he ultimately said his team will be ready for the challenge. "You have to deal with whatever's in front of you, but we anticipated he'd be part of this series at some point," Heat coach Erik Spoelstra said pregame. "We're not trying to duck competition at all. We expect them to have their guys, and we have to prove we can overcome ... it still comes down to us and how we impact the game." "He's an incredible, impactful player. [Embiid and Simmons], they have a maturity and a game that belies the experience they have in the league," Spoelstra added.